It looks like pretty much everything in your fridge/pantry/lunchbox is about to get a major makeover. In a joint press conference scheduled for later this morning at the White House, Michelle Obama and FDA officials are expected to announce proposed changes to the agency's food-labeling system. We've included one of two proposals below so you can see exactly what changes are being advanced. The most notable differences between the proposed new label and the old one is pretty clear: Calorie counts are featured larger and more prominently. In order to help consumers gauge just how much they're consuming, the number of servings contained in a given product has also been given more real estate on the label. More interestingly, the new label includes information on how much sugar has been added during processing, rather than just the product's total sugar content. The FDA says that the approval process for the new rules could take more than a year. 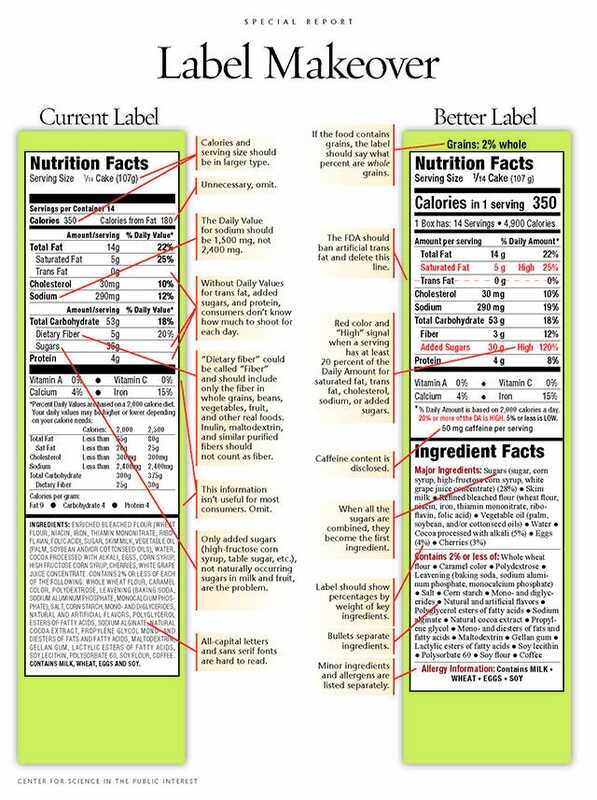 Still, this is a major milestone — today marks the first time the agency has changed its food labeling system in 21 years. In a statement released yesterday, the First Lady wrote, "This is a big deal, and it's going to make a big difference for families all across the country." Courtesy Of The Food And Drug Administration. Of course, to say these changes are long overdue is kind of an understatement — doctors and health experts have been calling for an overhaul to the system for years. In 2010, the Center for Science in the Public Interest, a food-policy nonprofit, released a report detailing a number of recommendations for design changes that would better reflect the ever-growing body of nutritional knowledge. There have been rumblings about a serious update to the labeling system for several months now. Experts were hoping for a multitude of changes, many of which seem to have made it into the new proposal — everything from disclosing how much sugar is added to fruit and veggie products like tomato sauce and green juice, to making calorie counts larger and easier to read. Many also had a problem with the way certain snack foods and drinks are marked as containing two servings, even though they're marketed as single-serving, on-the-go options. 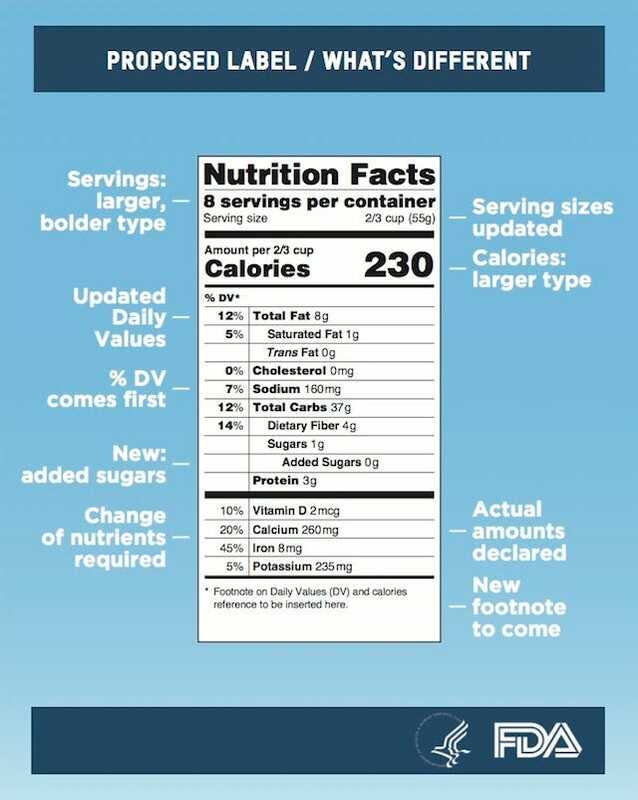 Thankfully, the FDA says that the new labeling system will be accompanied by more intuitive serving sizes that reflect the way we actually eat. For example, a 20-ounce bottle of soda will be considered one serving; that pint of Ben and Jerry's in your freezer will be two. Perhaps most importantly, the old labels reflected nutritional science that has become woefully out of date with the latest recommendations. The amount of sodium recommended by the FDA, for example, is 2,400 milligrams per day; most experts agree that number should be lowered to 1,500. The changes, then, while obviously a welcome step, arguably don't go far enough to encourage healthy eating. Yes, updating our serving sizes and addressing the sugar issue are definitely a positive move. But, there's no attempt here to educate Americans on just how much sugar they should have on a daily basis. And, while the FDA is promising a modest (undisclosed) decrease in the recommended daily value of sodium, nothing in the literature released today suggests that the proposed changes truly address current research on the effects of excess sodium. It bears mentioning that the FDA will accept public comment on the proposed changes for 90 days, beginning on Monday. What do you think? Did the FDA go far enough? Sound off in the comments below — and be sure to let the FDA know what you think, too.